Add it to Goodreads It took a single moment for her life to change. And she'll do anything to change it back. Ren Crown is a high school senior searching for her identity when a devastating attack on her twin brother thrusts her into a hidden world of magic. Fighting forces that she is woefully unprepared for, Ren illegally enrolls in a prestigious secret university where magic is plentiful and danger is absolute. Determined to set her family back to rights, she is blocked at every turn and faced with a new reality of boundless fascination and possibility. Animated creations, enchanted gadgets, and marvelous machines vie with the students themselves: mischievous engineers, diabolical tacticians, battle-hardened warriors, and terrifying roommates. But even amidst an eclectic student body, there is something off about Ren's magic...and the wrong people have started to notice. Caught in a tightening web, Ren's values stand trial, as does the fate of the world. Welcome to The Awakening of Ren Crown Tour! 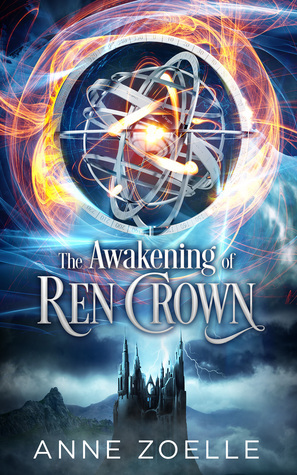 Today as part of the tour, I'll be sharing my thoughts with you on the first book in the Ren Crown Series! Don't forget to enter for your chance to win some great prizes including an Amazon Gift Card, Special Edition poster and coloring book and pens! Anne Zoelle is the pseudonym of a USA Today Bestselling Author. She is currently working on the next book in the Ren Crown series. I really really wanted to die hard love this one. But the world building was just a little to much. Which I never thought I would ever say. The other issue I had was that this was way longer than it needed to be. I think if the author would have cut some of the discriptions of the world building and got on with the story that it would have been so much better. It really felt like the first half of this book was nothing but world building and the plot starts half way through the book. The magic element was amazing and the characters were great. I really wish this book would have gotten on with the plot/story sooner. I did end up buying this as an ebook. its only .99 so check it out! I might give this one another try later on. Thanks so much for joining the tour! I loved that your review was honest, and we know that not every book is for every one :) I still loved reading your review!